On May 10th this year, a Cirrus aircraft with three people on board, having departed Bankstown an hour earlier on a pre sales demonstration flight, deployed its parachute over the Blue Mountains west of Sydney. The aircraft salesman (seated in the right seat) and the passenger (seated in the left seat), and one rear passenger managed to egress unharmed despite significant damage to the aircraft. Media was quick to speculate on the nature of the incident with many suggesting that the aircraft had inadvertently entered IMC or, based on reports of a ‘coughing engine’, assumed an engine failure. Neither were the case. The aircraft was flown as part of a pre purchase demonstration. The potential purchaser was seated in the left seat of the aircraft and was flying the aircraft a second time due in part because of his concerns over controllability issues associated with the stalled condition of flight. After a series of manoeuvres, the demonstration pilot took control of the aircraft and said, “Watch this”. The salesperson then proceeded to demonstrate a low speed stall with flap in a turn before losing control and entering a spin. Realising that he was unable to recover from the stalled condition of flight, he turned to the front passenger, said “I’m sorry”, and deployed the parachute. The parachute inflated when the aircraft was about 1000 feet above the ground (after reaching a maximum vertical speed of about 14,000 feet per minute). Given those figures, had the decision to deploy been delayed just a few seconds, the aircraft would have had insufficient altitude to inflate the parachute and land safely. After demonstrating a series of turns and a straight and level stall, the PIC selected 50% flap, rolled the aircraft into a left turn at about 25° angle of bank, reduced the power to idle, and raised the nose of the aircraft. The right wing dropped rapidly and the aircraft entered a spin to the right. When about 2,000 ft. above ground level, the PIC was unsure whether he then had enough height remaining to recover control of the aircraft, and elected to deploy the aircraft’s parachute. The rocket fired, the aircraft initially pitched up slightly and then as the parachute deployed, the aircraft pitched down rapidly into a nose low attitude. About 6 seconds after the rocket fired, the right snub line of the parachute released, followed by the left snub line, which then established the aircraft in a wings level attitude. 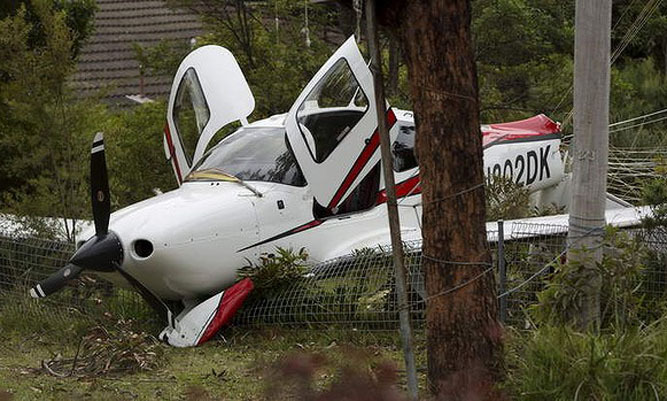 The aircraft narrowly avoided powerlines, collided with branches of a tree, and came to rest on a fence in the garden of a residential dwelling. The aircraft is not approved for spins, and has not been tested or certified for spin recovery characteristics. The only approved and demonstrated method of spin recovery is activation of the Cirrus Airframe Parachute System (CAPS). Because of this, if the aircraft ‘departs controlled flight,’ the CAPS must be deployed. Despite the reckless conduct that led to the uncoordinated condition of flight, the actions following the spin were exactly as the POH mandates. The overconfidence effect is a well-established bias in which “someone’s subjective confidence in their judgment is reliably greater than their objective accuracy, especially when confidence is relatively high”. In other words, the PIC thought he was better than he actually was. Given that the pilot in command had demonstrated the same or simular sequence between 30 to 50 times in the preceding six months, it was easy for the self-declared authority to established a false sense of expertise, and it created an environment where complacency would invariably set it. We’ve talked about this before. The accident, like most accidents in aviation, supports the notion that those in positions of authority have an illusion of control. Some pilots put themselves in a position where they feel that they have control over a situation while, in reality, they have very little (and none once they exceed their experience). As soon as the PIC exceeded a narrow envelope of operational comfort, he was a passenger in that Cirrus no different to the other two… the aircraft was now flying him. We’ve often argued that overconfidence is the most persuasive of all the cognitive biases – particularly amongst private pilots. It’s also possible that the pilot in command was more comfortable with various stall sequences because of the safety net provided by the aircraft’s emergency parachute system. In the same way we’re comfortable leaning off the side of a tall building while attached to a safety harness, perhaps the PIC was less risk averse knowing he had an escape. The pilot in command was faced with an interesting commercial pressure; the licenced passenger was a potential purchaser of the aircraft so the demonstration was essentially a means of reinforcing the Cirrus’ ‘superior’ handling as a pre-purchase selling point. Given that the stall characteristics was the customers concern, it’s only natural that the demonstration pilot would exaggerate the demonstration to support and alleviate the buyers concerns. Was the demonstration pilot an instructor? The report fails to provide this crucial information. Based on the numerous historic NTSB (and ATSB) reports of salespeople involved in incidents during pre-sales demonstrations, they’ll often fall victim to the Dunning-Kruger effect. It’s yet another bias that’ll manifest itself in unskilled and untrained individuals suffering from illusory superiority. Not unlike the case with ‘overconfidence’, they’ll often rate their skills and ability much higher than is actually the case (and they don’t have the understanding to appreciate their ineptitude or incompetence). The same bias often manifests itself in private pilots in the same way. There’s always a competence asymmetry during instructional sequences (in any situation where one pilot has ‘better information’ or more experience than the other). In this case, the passenger, a fully licenced private pilot, likely suffered from a Belief Bias. He wouldn’t have interfered with the actions of the PIC because “it couldn’t possibly go wrong.” The aircraft wasn’t certified for aerobatics, spinning wasn’t the intention of the demonstration, the PIC had conducted this exercise numerous times… and he was seen to be a type expert. Before the exercise had even commenced, the passenger had a clear expectation of the outcome (with an associated and flawed confidence in the PIC). Determinations based on influence are inexplicably more convincing than reasoned syllogism. The Belief Bias is formed on the basis of an expected conclusion rather than the strength of the individual components that support the outcome. Simply put, the licenced passenger had more confidence in the pilot in command and the outcome of the demonstration than he should have. Threats in the instructional environment are managed and mitigated first and foremost by a comprehensive briefing and unwavered understanding of what it is that will be demonstrated in various sequences. From all reports, the briefing was, at the very best, quite poor. The complacency, higher terrain (as a result of smoke over lower ground), and the stall sequences were all significant threats that all needed to be discussed in a reasoned classroom environment. In this case, the poor threat management led to potentially fatal errors. The ATSB report is quite brief and doesn’t come close to addressing some of the more pressing issues associated with the high-profile prang. Training in aerobatics and/or unusual attitude recovery. Only in understanding the limits of an aerobatic airframe can one come to understand how to avoid such as condition of flight in any airframe. The importance of having instructor qualifications can’t be overemphasised. Details of the PIC aren’t published in the report although given the poor conduct of the operation it suggests that the “instruction” was, at the very least, poor. Checklists, briefings, handover drills, and appropriate communication in flight was lacking. Complacency. The PIC claimed to have conducted these sequences numerous times (30-50 times in the previous 6 months). Familiarity breeds contempt, complacency and laziness. From the data presented in the report, it’s clear that the aircraft was in a fully developed spin. However, the report makes no mention of the different types of stalls, the wing drop and associated ‘recovery’, and the fully developed spin. The nature of the report owes itself a clearer definition and background for those that read it. Greater oversight may need to be applied to pre-sale demonstration flights, particularly when the pilot in command lacks instructional experience. A pre purchase sequence has to be manufactured that ensures factory-based quality assurance. Letting salespeople improvise sequences or vacate from a proven script is fraught with issues. A local resident managed to capture some footage on his mobile phone.